, beyond all comparison the first novel-writer of this country, was born at Sharpham Park in Somersetshire, April 22, 1707. His father, Edmund Fielding, esq. was the third son of John Fielding, D. D. canon of Salisbury, who was the fifth son of George earl of Desmond, and brother to William third earl of Denbigh, nephew to Basil the second earl, and grandson to William, who was first raised to the peerage. Edmund Fielding served under the duke of Maryborough, and towards the close of king George the First’s reign, or the accession of George II. was promoted to the rank of a lieutenant-general. His mother was daughter to the first judge Gould, and aunt to sir Henry Gould, lately one of the judges of the common pleas. This lady, besides Henry, who seems to have been the eldest, had four daughters, and another son named Edmund, who was an officer in the sea-service. Afterwards, in consequence of his father’s second marriage, Fielding had six half-brothers, George, James, Charles, John, William, and Basil. 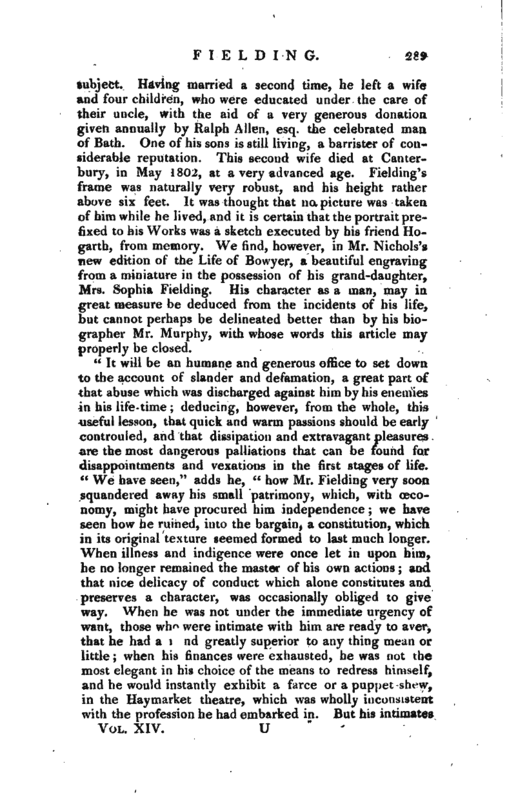 Of these nothing memorable is recorded, except of John, who will be the subject of a subsequent article as will also Sarah, the sister of Henry Fielding. His father died in 1740. | Henry Fielding received the first rudiments of his education at home, under the care of the rev. Mr. Oliver, for whom he seems to have had no great regard, as he is said to have designed a portrait of him in the very humorous yet unfavourable character of parson Tralliber, in his “Joseph Andrews.” From this situation he was removed to Eton school, where he had an opportunity of cultivating;* very early intimacy and friendship with several young men who afterwards became conspicuous personages in the kingdom, such as lord Lyttelton, Mr. Fox, Mr. Pitt, sir Charles Hanbury Williams, &c. who ever through life retained a warm regard for him. But these were not the only advantages he reaped at that great seminary of education; for, by an assiduous application to study, and the possession of strong and peculiar talents, he became, before he left that school, uncommonly versed in Greek authors, and a master of the Latin classics. Thus accomplished, at about eighteen years of age he left Eton, and went to Leyden, where he studied under the most celebrated civilians for about two years, when, the remittances from England not coming so regularly as at first, he was obliged to return to London. 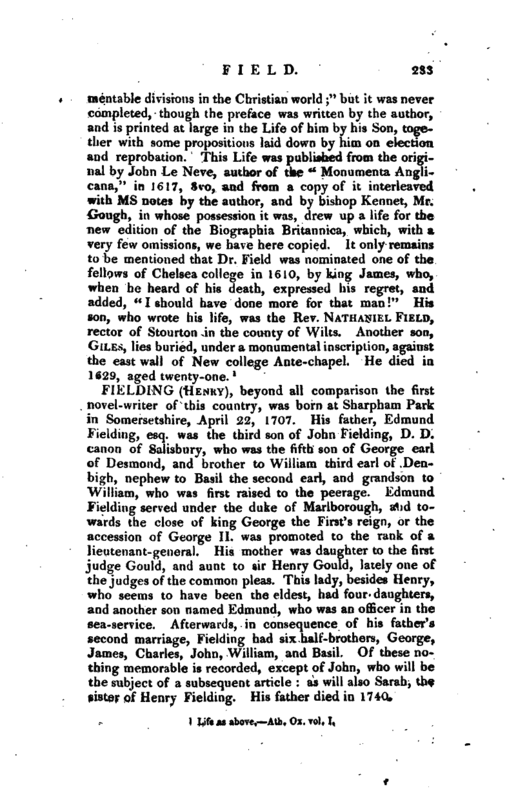 General Fielding’s family being very greatly increased by his second marriage, it became impossible for him to make such appointments for this his eldest son as he could have wished; his allowance was therefore either very ill paid or entirely neglected. This unhappy situation soon produced all the ill consequences which could arise from poverty and dissipation. Possessed of a strong constitution, a lively imagination, and a disposition naturally but little formed for Œconomy, Henry Fielding found himself his own master, in a place where the temptations to every expensive pleasure are numerous, and the means of gratifying them easily attainable. From this unfortunately pleasing situation sprang the source of every misfortune or uneasiness that Fielding afterwards felt through life. 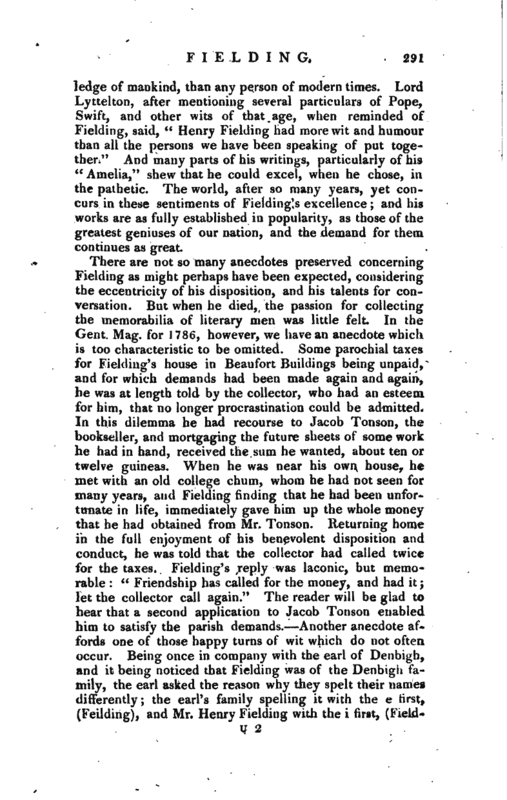 He very soon found that his finances were by no means proportioned to the brisk career of dissipation into which he had launched; yet, as disagreeable impressions never continued long upon his mind, but only rouzed him to struggle through his difficulties with the greater spirit, he flattered himself that he should find resources in his wit and invention, and acccordingly commenced writer for the stage in 1727, at which time he had not more than attained the completion of his twentieth year. | His first dramatic attempt was a piece called “Love in several Masques,” which, though it immediatetysucceeded the long and crowded run of the “Provoked Husband,” met with a favourable reception, as did likewise his second play, “The Temple Beau,” which came out in the following year. He did not, however, meet with equal success in all his dramatic works, for he has even printed, in the title-page of one of his farces, “as it was damned at the theatre-royal Drury-lane;” and he himself informs us, in the general preface to his miscellanies, that for the “Wedding-Day,” though acted six nights, his profits from the house did not exceed fifty pounds. 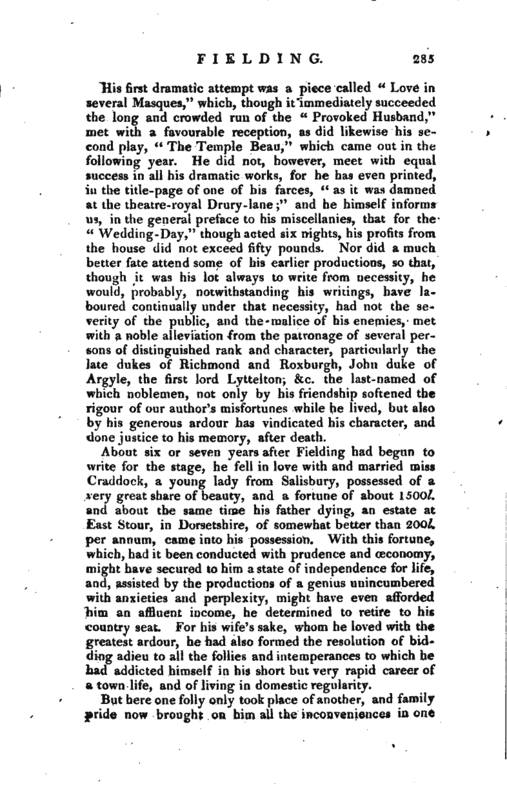 Nor did a much better fate attend some of his earlier productions, so that, though it was his lot always to write from necessity, he would, probably, notwithstanding his writings, have laboured continually under that necessity, had not the severity of the public, and the malice of his enemies, met with a noble alleviation from the patronage of several persons of distinguished rank and character, particularly the late dukes of Richmond and Roxburgh, John duke of Argyle, the first lord Lyttelton, &c. the last-named of which noblemen, not only by his friendship softened the rigour of our author’s misfortunes while he lived, but also by his generous ardour has vindicated his character, and done justice to his memory, after death. About six or seven years after Fielding had begun to write for the stage, he fell in love with and married miss Craddock, a young lady from Salisbury, possessed of a very great share of beauty, and a fortune of about 1500l. and about the same time his father dying, an estate at East Stour, in Dorsetshire, of somewhat better than 200l, per annum, came into his possession.With this fortune, which, had it been conducted with prudence and ceconomy, might have secured to him a state of independence for life, and, assisted by the productions of a genius unincumbered with anxieties and perplexity, might have even afforded him an affluent income, he determined to retire to his country seat. For his wife’s sake, whom he loved with the greatest ardour, he had also formed the resolution of bidding adieu to all the follies and intemperances to which he had addicted himself in his short but very rapid career of a town life, and of living in domestic regularity. But here one folly only took place of another, and family pride now brought on him all the inconveniences in one | place, that youthful dissipation and libertinism had done in another. Fond of shew and magnificence, he encumbered himself with a large retinue or servants; and led by natural disposition to enjoy society and convivial mirth, he threw open his gates for hospitality, and suffered his whole patrimony to be devoured up by hounds, horses, and entertainments. Thus, in less than three years, he dissipated his whole property; and from the mere passion of beingesteemed a man of great fortune, reduced himself to the unpleasant situation of having no fortune at all. He had thus, at the age of thirty, undermined his own supports, and had now no dependence but on his abilities. Not discouraged, however, he determined to exert his talents vigorously, applied himself closely to the study of the law, and, after the customary time of probation at the Temple, was called to the bar, and made no inconsiderable figure in Westminster-hall. 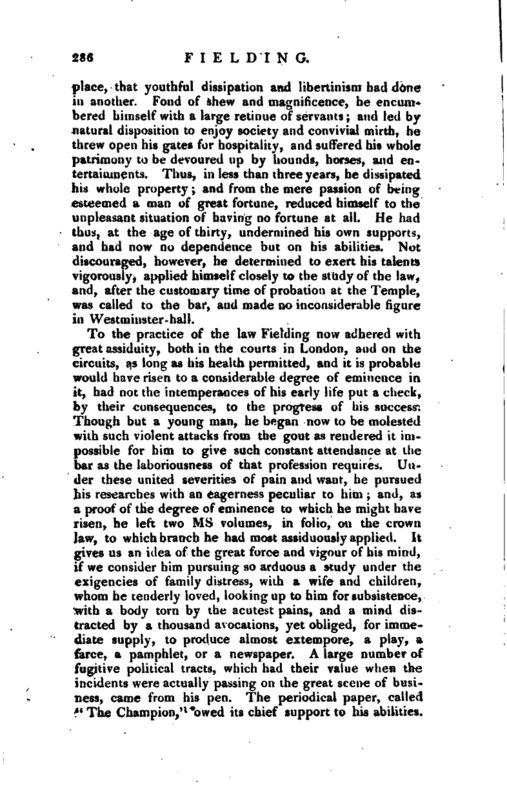 To the practice of the law Fielding now adhered with great assiduity, both in the courts in London, and on the circuits, as long as his health permitted, and it is probable would have risen to a considerable degree of eminence in it, had not the intemperances of his early life put a check, by their consequences, to the progress of his success. Though but a young man, he began now to be molested with such violent attacks from the gout as rendered it impossible for him to give such constant attendance at the bar as the laboriousness of that profession requires. Under these united severities of pain and want; he pursued his researches with an eagerness peculiar to him; and, as a proof of the degree of eminence to which he might have risen, he left two ms volumes, in folio, on the crown law, to which branch he had most assiduously applied. It gives us an idea of the great force and vigour of his mind, if we consider him pursuing so arduous a study under the exigencies of family distress, with a wife and children, whom he tenderly loved, looking up to him for subsistence, with a body torn by the acutest pains, and a mind distracted by a thousand avocations, yet obliged, for immediate supply, to produce almost extempore, a play, a farce, a pamphlet, or a newspaper. A large number of fugitive political tracts, which had their value when the incidents were actually passing on the great scene of business, came from his pen. The periodical paper, called “The Champion,” owed its chief support to his abilities. | A poetical epistle to the right honourable sir Robert Walpole, written in 1730, shews at once his acquaintance with distress, and the firmness of mind with which he supported it. 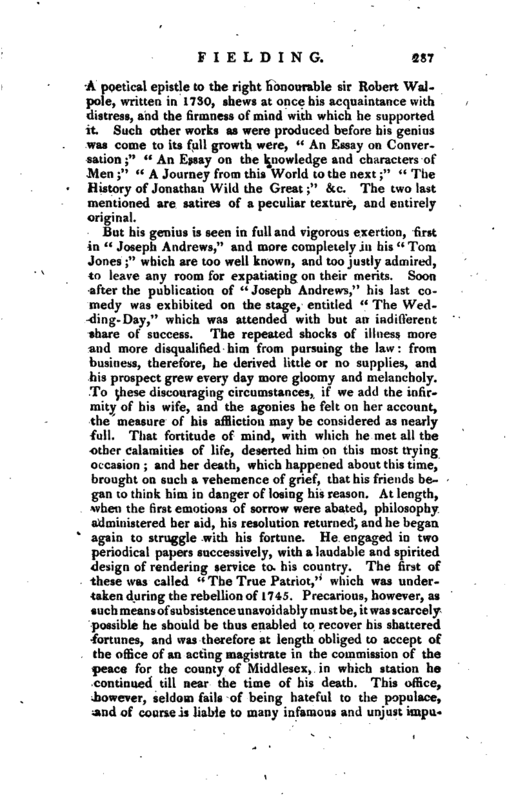 Such other works as were produced before his genius was come to its full growth were, “An Essay on Conversation” “An Essay on the knowledge and characters of Men” “A Journey from this World to the next” “The History of Jonathan Wild the Great;” &c. The two last mentioned are satires of a peculiar texture, and entirely original. 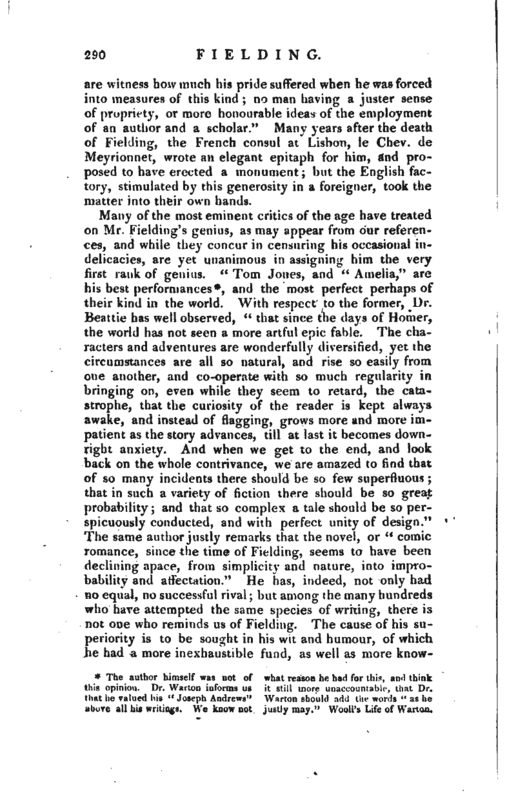 Fielding’s genius excelled most in those strong, lively, and natural paintings of the characters of mankind, and the movements of the human heart, which constitute the basis of his novels; yet, as comedy bears the closest affinity to this kind of writing, his dramatic pieces, every one of which is comic, are far from being contemptible. His farces and ballad pieces, more especially, have a sprightImess of manner, and a furcibleness of character, by which it is impossible not to be agreeably entertained; and in itiose which he has in any degree borrowed from Moliere, or;.ny other writer, he has done great honour and justice t>j Irs original, by the manner in which he has treated the | subject. Having married a second time, he left a wife and four children, who were educated under the care of their uncle, with the aid of a very generous donation given annually by Ralph Allen, esq. the celebrated man of Bath. One of his sons is still living, a barrister of considerable reputation. 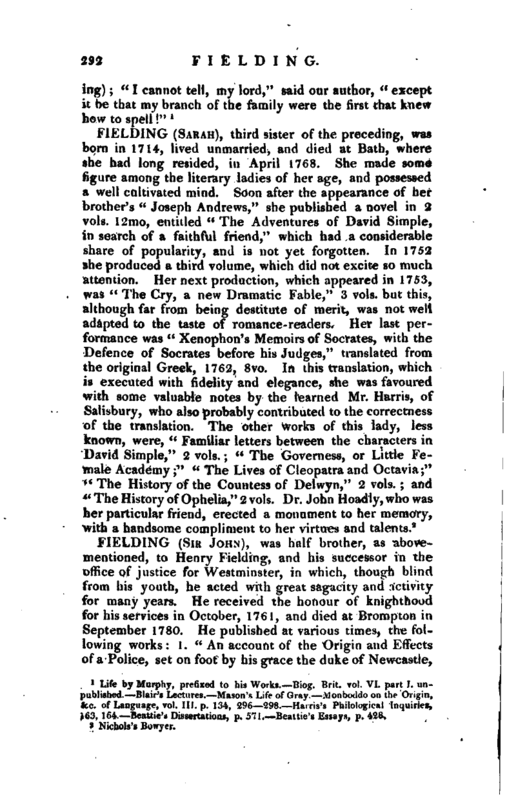 This second wife died at Canterbury, in May 1802, at a very advanced age. Fielding’s frame was naturally very robust, and his height rather above six feet. It was thought that no picture was taken of him while he lived, and it is certain that the portrait prefixed to his Works was a sketch executed by his friend Ho r garth, from memory. We find, however, in Mr. Nichols’s new edition of the Life of Bowyer, a beautiful engraving from a miniature in the possession of his grand-daughter, Mrs. Sophia Fielding. 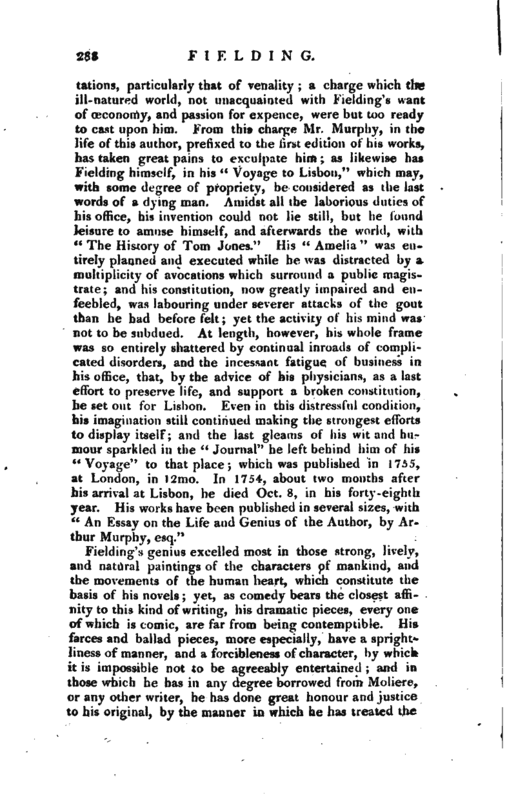 His character as a man, may in great measure be deduced from the incidents of his life, but cannot perhaps be delineated better than by his biographer Mr. Murphy, with whose words this article may properly be closed. “It will be an humane and generous office to set down to the account of slander and defamation, a great part of that abuse which was discharged against him by his enemies in his life-time; deducing, however, from the whole, this useful lesson, that quick and warm passions should be early controuled, and that dissipation and extravagant pleasures are the most dangerous palliations that can be found for disappointments and vexations in the first stages of life.” We have seen,“adds he,” how Mr. Fielding very soon squandered away his small patrimony, which, with oeconomy, might have procured him independence; we have seen how he ruined, into the bargain, a constitution, which in its original texture seemed formed to last much longer. When illness and indigence were once let in upon him, he no longer remained the master of his own actions; and that nice delicacy of conduct which alone constitutes and preserves a character, was occasionally obliged to give way. When he was not under the immediate urgency of want, those who were intimate with him are ready to aver, that he had a mind greatly superior to any thing mean or little; when his finances were exhausted, he was not the most elegant in his choice of the means to redress himself, and he would instantly exhibit a farce or a puppet -shew, in the Haymarket theatre, which was wholly inconsistent with the profession he had embarked in. But his intimates | are witness how much his pride suffered wben he was forced into measures of this kind no man having a juster sense of propriety, or more honourable ideas of the employment of an author and a scholar." Many years after the death of Fielding, the French consul at Lisbon, le Chev. de Meyrionnet, wrote an elegant epitaph for him, and proposed to have erected a monument; but the English factory, stimulated by this generosity in a foreigner, took the matter into their own hands. The author himself was not of this opinion. Dr. Warton informs us that he valued his “Joseph Andrews” above all his writings. We know not what reason he had for this, and think it still more unaccountable, that Dr. Warton should add the words “as he justly may.” Wooll’s Life of Warton. and the most perfect perhaps of their kind in the world. With respect to the former, Dr. Beattie has well observed,” that since the days of Homer, the world has not seen a more artful epic fable. The characters and adventures are wonderfully diversified, yet the circumstances are all so natural, and rise so easily from one another, and co-operate with so much regularity in bringing on, even while they seem to retard, the catastrophe, that the curiosity of the reader is kept always awake, and instead of flagging, grows more and more impatient as the story advances, till at last it becomes downright anxiety. And when we get to the end, and look back on the whole contrivance, we are amazed to find that of so many incidents there should be so few superfluous; that in such a variety of fiction there should be so great probability; and that so complex a tale should be so perspicuously conducted, and with perfect unity of design.“The same author justly remarks that the novel, or” comic romance, since the time of Fielding, seems to have been declining apace, from simplicity and nature, into improbability and affectation.“Fie has, indeed, not only had no equal, no successful rival; but among the many hundreds who have attempted the same species of writing, there is not one who reminds us of Fielding. The cause of his superiority is to be sought in his wit and humour, of which he had a more inexhaustible fund, as well as more | knowledge of mankind, than any person of modern times. Lord Lytteiton, after mentioning several particulars of Pope, Swift, and other wits of that age, when reminded of Fielding, said,” Henry Fielding had more wit and humour than all the persons we have been speaking of put together.“And many parts of his writings, particularly of his tc Amelia,” shew that he could excel, when he chose, in the pathetic. 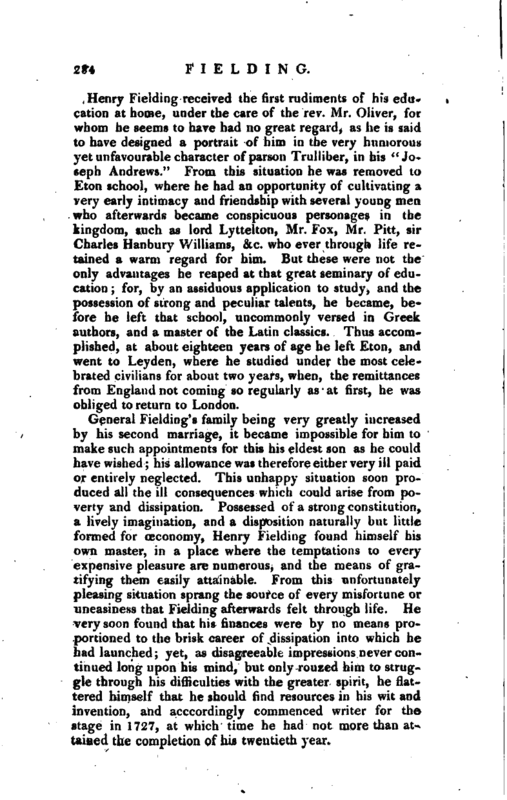 The world, after so many years, yet concurs in these sentiments of Fielding’s excellence; and his works are as fully established in popularity, as those of the greatest geniuses of our nation, and the demand for them continues as great. Life by Murphy, prefixed to his Works. Biog. TJrit. vol. VI. part I. unpublished. Blair’s Lectures. Mason’s Life of Gray Monboddo on the Origin, cc. of Language, vol. Iij. p. 134, 296 298. Harris’s Philological Inquiries, 163, 164. ISeattie’s Dissertations, p. 571. Seattle’s Essays, p. 428.